"Mustafa Garcia's Halal Meat Supply"
And an 'urban camouflage' paint scheme that looks like splatters of brown stuff. That should keep most people at a distance. With apologies to Red Green. "Blackwater Mobile Nuclear Disposal Unit"
"Blackwater Mobile Nuclear Disposal and Custom Nightlight Designer"
I've seen your website. It looks really good. Do you have any info on the tires/wheel setup I see pictures of. They look like the new Earthroamer wheels. Once upon a time, a long, long time ago... I made a horrible mistake and ordered 5 wheels from USA6x6 with a "6 week delivery." Together with that was supposed to be 5 Michelin XZL 20" tires. This was back in the days before I Googled every supplier I work with to see if there are lots of Internet postings warning what thieves they are. (like this! )They switched the tires to much lower rated military tires, and then said "oops, well we can't get the XZL's anymore anyhow"
6 MONTHS LATER my wheels finally show up. We mounted the Continental tires on them, filled them up with air and within 24hrs all 5 are flat because the welds on the wheels all leaked. We tried to break apart the bolt-togethers and discovered that some idiot in their shop put silicone sealant between the bolt-togethers rather than a rubber o-ring so it took a forklift to break them. I sent those back and told USA6x6 I wanted my money back rather than having them fix them. Daniel insisted that he had just got a 'new set in' and these were much better and he'd do all the shipping both ways for free. I knew I wasn't going to get my money, and I still needed wheels, so I stupidly said "ok". 6 weeks later the next set of wheels show up. Except this time there are only 4 wheels (not 5) and 1 of the 4 of them are different from the other 3. My guys in Michigan told me that these wheels have some strange internal bead locks (i.e. - not usual beadlocks) on them and they couldn't get my tires mounted on them. Also, They were hub-centric, not stud-piloted, which means the hole pattern matched, but the stud sizes were different. We toyed with the idea of changing my studs, or putting sleeves on them, or something stupid like that, but then gave up bothering to even pursue these. Especially since I'd still need 2 more for the spares. Then USA 6x6 went bankrupt, and the whole world is hunting down Daniel, so I gave up on the money I've obviously lost with those jokers, and stopped trying to fix the wheels to start looking for others. I have tried sourcing bolt-togethers from Hutchinson, (who makes the EarthRoamer wheels) but have had no luck reaching anyone there who knows what I'm talking about. At this point I'm thinking about giving up on my plan of having 20" super singles with 2-piece bolt-togethers for field servicing (and all of the benefits that I thought would go along with those) and just selling my Continentals for a set of 22.5" tires that I can run as duallies on my existing Alcoas. I gain extra load capacity. I lose the tracking benefits. I lose the ability to change a tire in the field. hmmm.... no wait, that doesn't sound too good! Any suggestions / advice / criticisms / sarcastic "I told you so's" are grudingly welcome! wow...that's a lot to digest. All I can say is good luck!!! I'm not sure I follow this. Couldn't you change the tire by hand using tire irons? I just practiced this on my Fuso tires to make sure I could do it. I'd never done it before but was able to carry it out. There is a good YouTube video showing a guy changing a truck tire by hand in short order. As we've discussed in the past, I'm also exploring super single options. I'll try to recap what I've found for everyone. Stockton - yes they'll make custom steel 20x11 wheels, but won't meet your payload requirements. They made the wheels for the first TurtleV. Hutchinson - yes they make the Earthroamer 20x11 aluminum beadlock wheels for the F550. 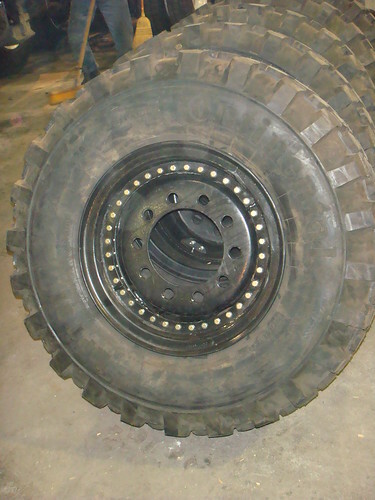 The wheels they supply to Earthroamer are load rated for 6779lbs. They use the same wheel front and back with an adapter plate. The wheels weigh about 110lb and the MPT 335s are 122lbs. They are very cool, but not cheap. My contact is Bill O'Hara (Sales & Marketing Manager - Wheel Division) bohara@hutchinsoninc.com Phone: 609-858-5661. He's been very good about responding. It looks like you have the 22.5x8.25 10-lug wheels. If you have the same 225mm (8.85 in) bolt circle as the current model F550, the Earthroamer Hutchinson wheels should work for the MPT 365s. If not, maybe they'll build you a set. They do a bunch of military work and may have other options. 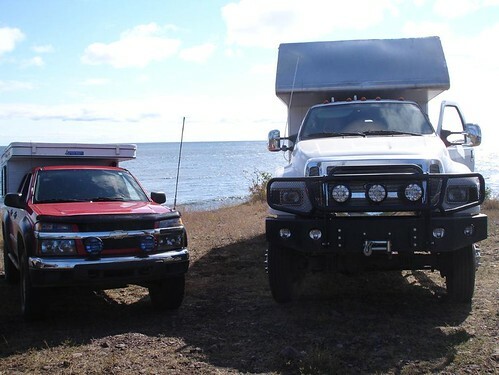 Rickson - Many truck camper owners with SRW trucks upgrade to Rickson 19.5s. They also do custom orders. I'm currently considering a set of 20x11 or 19.5x8.25 steel singles for use with my F550. The cost is about the same. The 20s are load rated for 6750lbs. 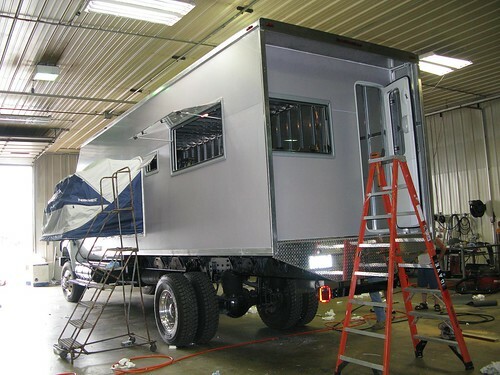 Contact Dan Richter (www.ricksontruck.com dan@ricksontruck.com Phone: 410-771-9501). Not enough load capacity. The 365s have a load rating of 7100kg = 7830 lb and I think he will need every last ounce of that. Accuride bolt-together wheels vary depending on offset but are at least 9370 lb, ranging up to 12000. Thanks for the great information & contacts. 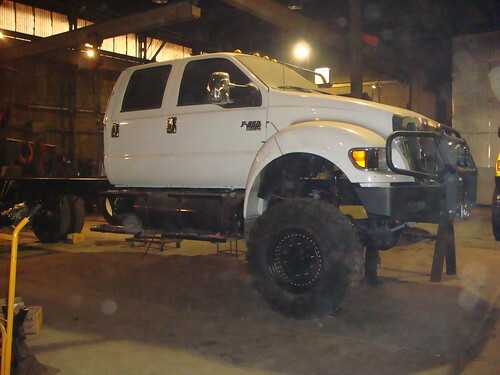 Congratulations btw on taking the plunge and starting your F550 flatbed project. I know you've been wanting to for a while, so It's great that now you can start to play. Let us know if we can help at all. We lose the ease of access to the inners, and the tracking challenges, but at least the load is better distributed (i.e. lower PSI on the ground) and we get the advantages of the bolt-togethers. You're right, I could always use tire irons / "tyre pliers". But the thought of trying to pry one of those MPT's off the rim using nothing but elbow grease is not particularly attractive. - Especially in the extreme heat/cold/rain/etc. Jay, 22.5's pop on and off quite easily with a proper set of tire irons, get the same ones a commercial tire shop uses. We do all of our own tire swaps and mount 48x31x22.5 floatation tires by hand too. Speaking of spare tires... How do you plan on carrying those. I didn't see any type of tire mount off the back on the U.P. trip pictures that I have. Or do you plan on carrying them under the back end of the chassis somehow? Oooh... That brings up the back end of truck, one of my favorite parts! 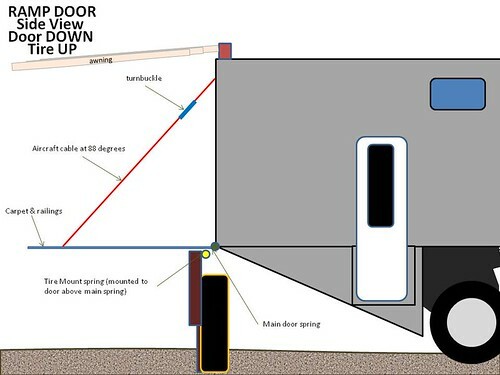 Essentially what happens is we have taken a standard cargo/toy-hauler ramp door and designed it to mount on the back edge of the vestibule with a lock-out so that it can only go down 90'. On the 'top-side' (i.e. inside surface) of the door is some outdoor carpeting and fold-up railings. Over the rear 'patio' area then there is a small Fiamma van awning, with an add-a-room attachment, so we can close that area in if we want to in inclement weather. 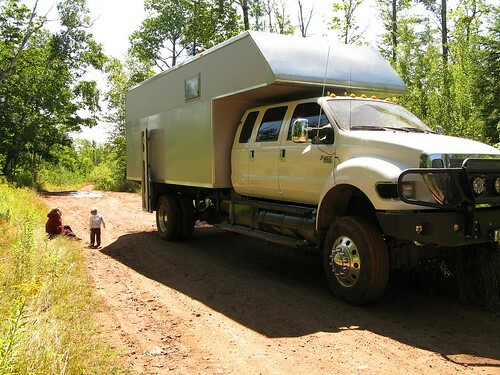 This essentially adds an extra 100 sq ft of living space to the camper, without really taking up any space. 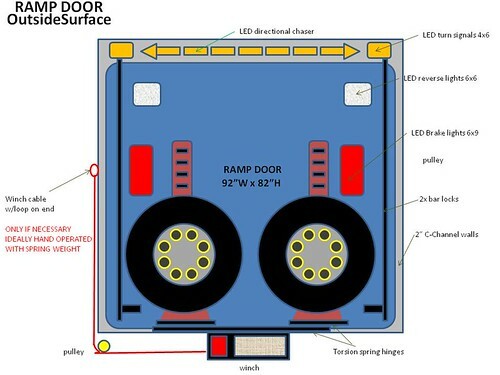 Then... on the back of the door is mounted the two spare tires/wheels on a separate hinged mechanism that can allow them to lower down independently. Even with the ramp door up/closed there is still an are about 17" deep between the ramp door and the 'inside' door/window. In that vestibule area will be two 25gal stainless steel tanks (built into the side walls) to hold the pre-filtered water (i.e. they will be empty 90% of the time)... and storage room for bikes / strollers / spare-parts / etc. Thanks for the tip, we're certainly considering it! 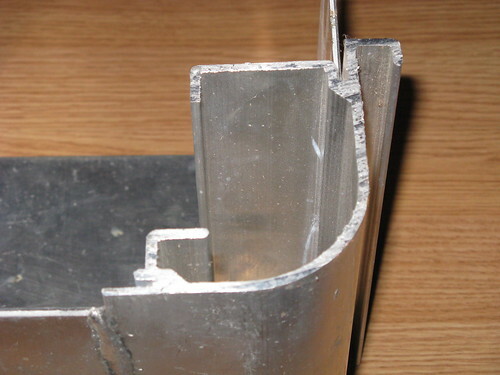 We bought it through Postal Extrusions who sell it in lengths up to 168 inches, for about $80. They don't sell to the public, but Scott said he'd happily order some for you if you want. Such a great project. Not only is your truck cool, your well documented thoughtfulness in the design is amazing. I applaud your intent to use Bio-Diesel as much as possible. Though Bio-Diesel availability is expanding widely across the world, it seems like you will be spending most of your time in places with limited supply. Have you considered using veggie oil? Good luck with the adventures!